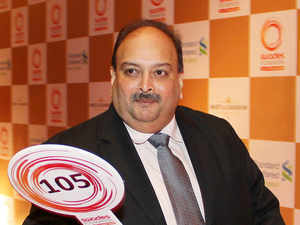 Mumbai: One of the key accused in the PNBfraud case, Mehul Choksi, on Friday moved a fresh application in a special Prevention of Money Laundering Act (PMLA) court in Mumbai seeking cancellation of a non-bailable warrant against him. His application came three days after his nephew Nirav Modi, another key accused in the Rs 13,500-crore Punjab National BankNSE -2.14 % loan default case, was arrested in London. In his application, Choksi, who had fled India in January 2018 months before the scam surfaced, has cited ailment and risk to his life. Choksi’s lawyer Sanjay Abbot in the application said the jeweller has a long history of heart ailments and a blood clot in the brain. He also mentioned in the application about Choksi’s apprehension over his safety. On May 22, 2018, after taking cognisance of the second chargesheet filed in the PNB case by the Central Bureau of Investigation (CBI), the special court had issued the non-bailable warrant against Choksi, owner of Gitanjali Group. His move comes two days after the investigation agencies said that Choksi’s extradition process has begun in Antigua where he has taken citizenship. The court has adjourned the matter for April 9 for arguments. Choksi’s counsel submitted his detailed medical history citing his ailments constraining him from travelling and hence leading to his inability to return to India. His counsel also placed 38 documents on record, including a latest prescriptions in which doctors recommend that Choksi should remain under continuous medical supervision in Antigua and should avoid travelling as his medical condition may deteriorate. Choksi, along with his nephew and diamantaire Nirav Modi are accused of colluding with bankers to secure credit from overseas banks using fraudulent guarantees. Both have denied the allegations and have moved abroad. Nirav Modi was taken into custody in London on March 19. However, Choksi had secured a passport from Antigua and Barbuda, where wealthy foreigners can become citizens in exchange for investing in the country. He was granted citizenship on January 15, 2018. He then deposited his cancelled Indian Passport No. Z3396732 and a mandatory fee of $177 for other formalities.